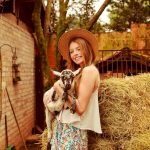 Looking For The Best Carpet Cleaner Solution For Pet Urine? Here’s a look at our favorites, including our top pick – Pet Stain & Odor Miracle. Spot treatment – these cleaning solutions are ideal for treating a small affected area. 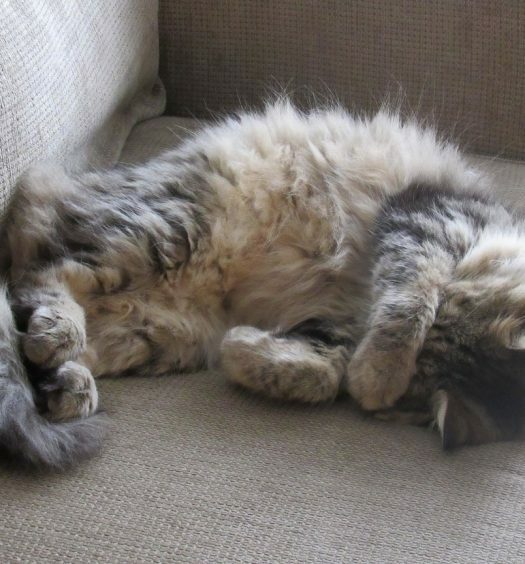 When your pet has an accident, you can use a spot treatment to remove the stain and deodorize the area. Pre-treatment – these types of sprays should be used immediately before cleaning the floor with a deep-cleaning machine. They shouldn’t be used as a spot-treatment unless the solution is a 2-in-1 treatment that pre-treats and spot cleans. Deep-cleaning solution – these cleaning solutions should be used with a deep-cleaning machine from Bissell, Hoover, or Rug Doctor. They’re ideal for cleaning the floor of an entire room rather than in single affected spots. Saying that your product is a miracle is definitely a bold claim, but in this case, the customer reviews back it up. 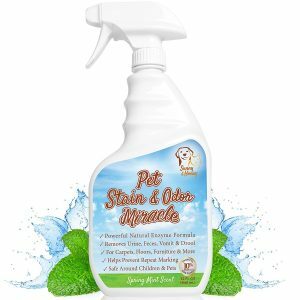 The Pet Stain & Odor Miracle cleaner by Sunny & Honey uses a powerful natural enzyme formula to clean up stains and odors from urine, feces, vomit, and drool. Because it’s all natural, it’s perfectly safe to use around the house with kids and pets. 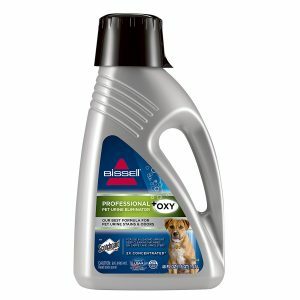 You can use this cleaner on all surface types, including carpets, furniture, pet beds, crates, hardwood, and laminate. As a bonus, it’s also made right here in the good old USA. Hoover is one of those brands where you can simply trust in the name. They haven’t achieved their dominance in the carpet-cleaning world without merit, and this cleaner is no exception. Unlike the first option we talked about, you’ll want to use this with a deep-cleaning machine from Hoover, Bissell, or Rug Doctor. It’s double-concentrated, so you can clean more while using less. Although it isn’t an all-natural solution, it is phosphate-free and septic safe. The formula is enhanced with enzymes to remove and deodorize stains and messes. It works great on any fabric surface, including carpet, rugs, upholstery, and car seats. If you want to stay in the Hoover family but don’t have a deep-cleaning machine, this is a great spot cleaner that pre-treats and removes pet stains. It’s their most powerful carpet and upholstery spot spray, so you can trust it in just about any situation. 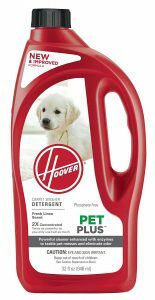 Hoover Expert Pet spray is made with powerful enzymes that break down biological stains, dirt, and odors from carpets and upholstery, leaving a clean surface and a fresh scent. If you’ve used an inferior pet-spot treatment spray that cleans alright but doesn’t get the smell out, this is a great professional-grade solution to come in and finish the job. For optimal use, Hoover recommends using this spray as a pretreatment before washing the area with a deep cleaning solution. You probably don’t need to do all that every time your pet leaves you a mess, but it’s good to do a deep clean periodically to keep your house looking and smelling fresh. Here’s another solution for those with a deep-cleaning machine, and it works with all 3 manufacturers—Bissell, Hoover, and Rug Doctor. It’s engineered to permanently remove stains and odors at the source with the power of Oxy, and replaces odors with a fresh, clean scent. The solution works to protect against future stains with a Scotchgard protector, and it includes a special scent that’s intended to discourage from pets from urinating in the same spot again. In a nod to its potency, there are even some reviews that say it works on stains and odors from skunks (though I’m not quite sure what kind of people have a skunk inside their house in the first place). 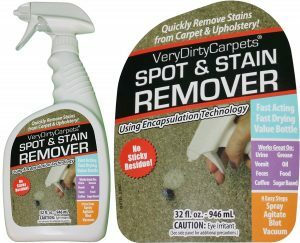 Last but not least is the Spot & Stain Remover from VeryDirtyCarpets. This solution is actually engineered to be an all-purpose spot cleaner, so it’s a great purchase if you’ve got more than just pet stains around the house that need cleaning. That said, it’s not designed for color-based or set stains, so it may not be the best solution if your pet’s urine has had time to set (or of course if we’re talking about a different kind of accident on the carpet). Interestingly, this spot cleaner is specifically designed to fight against rebound staining, which is what happens when a spot you’ve recently cleaned ends up developing a larger, darker stain over the following week. I have to admit that when I’ve seen those develop, I’ve always thought I just didn’t clean the area well enough—and it turns out I’ve been wrong. With rebound stains, what actually happens is the cleaning solution you use has left a sticky residue that attracts dirt and dust to the carpet. To avoid this, the VeryDirtyCarpets cleaner encapsulates the soiling in a polymer-based non-stick powder that will easily vacuum out of the carpet or upholstery once it’s dry. With that understanding, keep in mind you’ll need to vacuum the affected area each time you use this spot treatment in order for it to work optimally. In addition to working on fresh pet stains, the solution is proven to work well with oils, food stains, and sugary foods. In the ideal scenario, it’s best to have a deep-cleaning machine that you can use to periodically cleanse the carpets, and to use a spot-treatment spray in between deep cleans. It’s recommended to deep clean your carpets seasonally, but you may want to do it more regularly if your pet frequently urinates on the carpet.